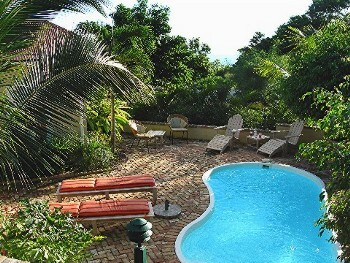 and surrounded by a private tropical garden, then this is the place for you. 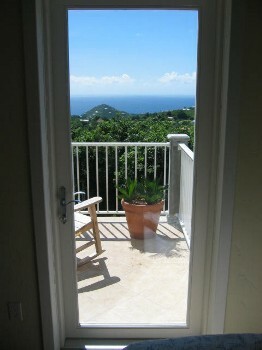 Caribbean views from every room in the house will mesmerize you as the ridge-top breezes cool you after a day at the beach. Our house has two bedroom suites on opposite sides of a great room. 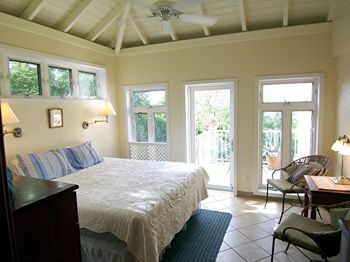 Each has a king-sized bed and its own en suite bathroom, individually zoned air-conditioning, and private access to a porch overlooking the Caribbean. 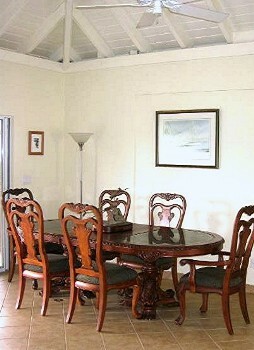 adjacent to the Virgin Islands National Park. Children are counted as people but infants (defined as not yet walking and sleeping in the crib) are free. $50 Security Waiver Fee added (covers up to $500 accidental damages). We are entirely committed to protecting the Island's fragile environment. 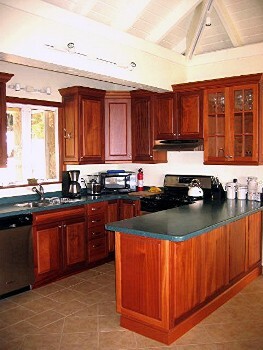 We guarantee that all products and practices encountered at the house are as earth-friendly as possible. laundry appliances are brand new and top quality. Our house has two bedroom suites on opposite sides of a great room. 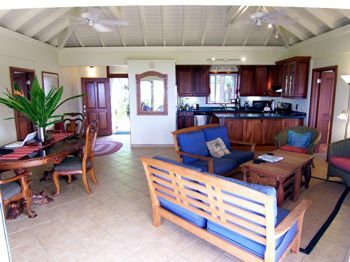 Each has a king-sized bed and its own en suite bathroom, individually zoned air conditioning, and private access to a porch overlooking the Caribbean. Each bedroom suite also has a full-sized closet, two built-in dressers, and somewhere comfortable to sit and relax. 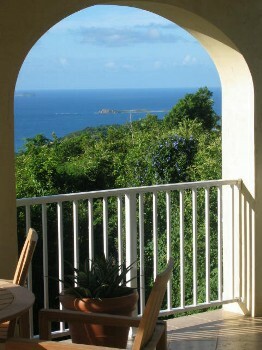 of St John and offer expansive views of the Caribbean. 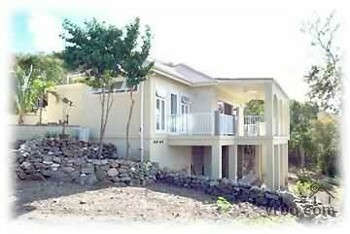 The house was built in 2005 and everything is brand-new, state of the art, and in perfect condition. 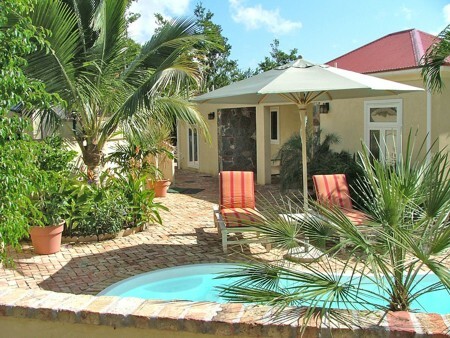 A lush garden surrounds the private brick patio that encloses a swimming pool, barbecue area, plentifully seating, hammocks, and lots of space to idle away from it all. 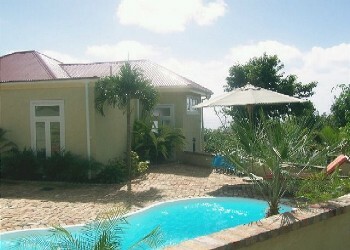 The villa sits one mile outside Cruz Bay, high up on the ridge in the saddle between Caneel Hill and Margaret Hill, adjacent to the Virgin Islands National Park. Forty yards from our backyard, through National Park land, is Caneel Hill Trail, which drops down to the secluded white sand beaches on the North Shore (Honeymoon Beach, Caneel Bay and Solomon Bay) in less than 45 minutes, and drops down to the town of Cruz Bay with a half-hour hike in the other direction. A 1/4-mile hike brings you to the Caneel Hill Observation Platform, where you can see a 360-degree view of both the Caribbean and Atlantic as well as the entire Western Half of St John. From Caneel Trailside Cottage's doorstep you can literally hike through the forest to get everywhere you will need to be on the western half of St. John. Shopping, Sightseeing, Restaurants, Kayaking, Sailing, Boating, Parasailing, Jet Skiing, Shelling, Swimming, Snorkeling/Diving, Surfing, Windsurfing, Wildlife Viewing, Hiking, Fishing, Fitness Center/Gym, Health/Beauty Spa, Museums.